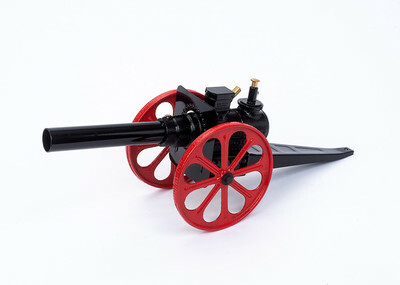 A smaller version of Major Field cannon,this model is 17 inches long, 3 1/2 pounds. It features the automatic charger mechanism and automatic ignitor for more rapid firing and is louder than 9" Light Field cannon model. Shipping Fee:This cannon is not eligible for shipping discounts or promotions. Each cannon is shipped in its own box and is subject one standard S&H fee. If additional items are ordered ( besides extra bangsite or flints ) a seperate S&H Fee will be charged for those items. Note: If these additional fees are required they may not be included in the shopping cart total for your order. The additional cost will be added to your invoice when your order is shipped and your creditcard is charged. See shipping information for standard ground shipping rate information or email customer service for more information.